The BRICS countries recently met in The Hague to discuss the situation in Ukraine. The generally moderate position expressed by the group’s joint statement indicates that they could play a mediating role in resolving the Ukrainian crisis, a part which China has already expressed an interest in playing. On the sidelines of the Nuclear Security Summit, held in The Hague on March 24-25, the foreign ministers of the so-called BRICS countries – Brazil, Russia, India, China and South Africa – conducted a separate meeting. They of course could not avoid exchanging their views on the situation in Ukraine. Later, at a press conference in The Hague, the head of the Russian Foreign Ministry, Sergei Lavrov, commented on his meeting with his colleagues from the other BRICS countries. “As for the meeting of foreign ministers of the BRICS countries, we heard their expressions of understanding of the situation, about understanding the historical aspects of this whole situation, and we are grateful to our partners for this,” said Lavrov, referring to the discussion of the Ukrainian crisis. His BRICS colleagues rejected the use of sanctions and “hate speeches” made against Russia by leaders of Western powers. “Increasing the use of hate speech, sanctions and counter-sanctions, as well as the use of force, are not conducive to a sustainable peace settlement, in accordance with the principles of international law, including the principles and purposes of the UN Charter,” reads the statement issued after the meeting. BRICS members also criticized the proposal to exclude Russia from participation in the G20 Summit in Brisbane this November, put forward by Australian authorities. Mr. Lavrov pointed out that the G20 was not created by Australia, which only has the chairmanship in 2014. “The G20 was created by all the countries acting together, and the work of this mechanism will continue as the countries had originally intended,” he said, speaking on behalf of the BRICS group. The outcome of the BRICS meeting demonstrates that the members of this group do not subscribe to the West’s position on the issue of putting pressure on Moscow in response to Russia’s absorption of Crimea. 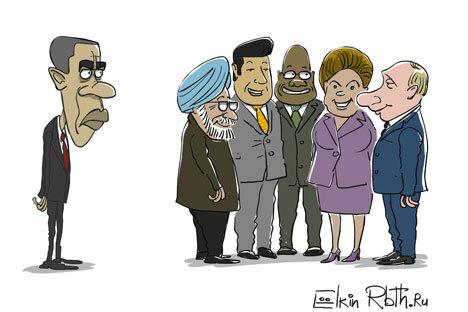 However, within the BRICS, differences were observed about the situation in Ukraine. China, which resolutely opposes the independence of Tibet and Taiwan, treated the entry of Crimea into the Russian Federation with great caution. Discussions about the situation in and around Ukraine took up a significant part of the talks between Chinese President Xi Jinping and U.S. President Barack Obama in The Hague. The Chinese leader called for a political solution to the crisis and put forward his own proposals, indicating that Beijing would not be content to remain in the role of observer in this situation. He called for the prompt establishment of an international coordination mechanism. Another element of his initiatives was his call on the involved parties not to take any actions that might lead to further deterioration of the situation. Hence, we can conclude that China is ready to join talks between representatives of Russia, the West and Ukraine in order to help de-escalate the conflict. Although Beijing does not have great experience in such diplomatic missions, it has clear advantages compared with other countries. Firstly, this is due to the country’s strategic partnership with Russia, and second, because China has already cooperated for many years with Ukraine, including in the military-technical sphere. And finally, China has been able to establish sufficiently trusting relations with the United States. To wit, we cannot rule out that Chinese diplomacy may soon come to the foreground in the resolution of the Ukrainian crisis.